that this is a healthier version, so you can feel good about it feeding it to your family! I ate a lot of BLT's growing up and it's still one of my favorite sandwiches today. 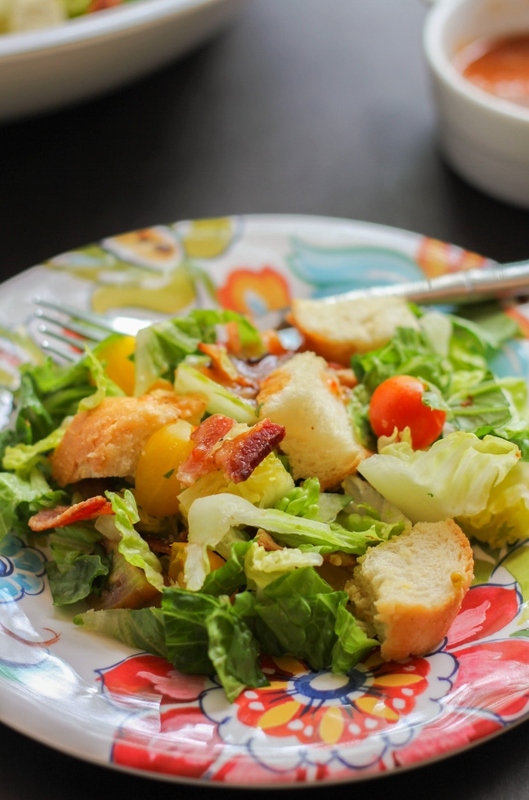 What could be better than toasted bread, crispy bacon, juicy tomatoes and soft lettuce? In my mind, not much! To be honest, everything is just better with bacon, am I right? My family eats bacon often, whether it's served with pancakes for breakfast, on a sandwich, or in this salad. I can't seem to get enough of it! 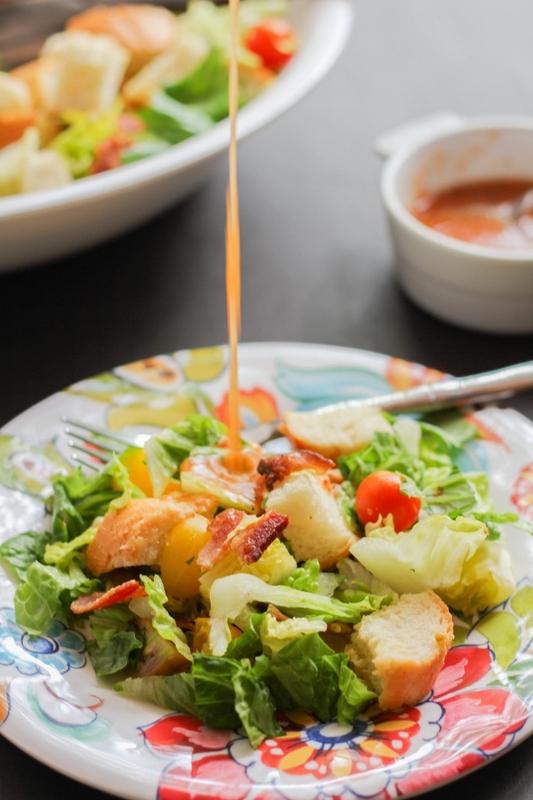 What's great about this salad is that it's so much lighter than the classic sandwich, which means you can eat more of it and not feel guilty. There's more lettuce, a little less bread, plus a light vinaigrette instead of the traditional mayo. 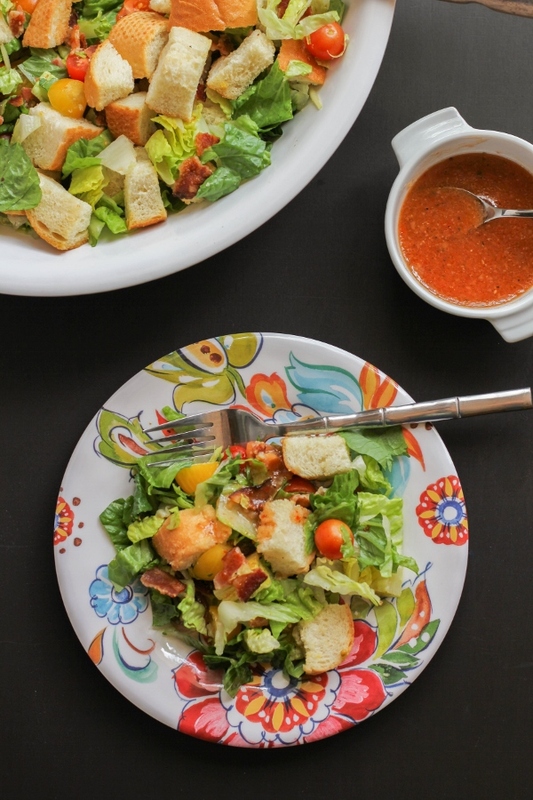 I used an olive oil roasted red pepper vinaigrette, but you can substitute your favorite dressing here. This is also a really simple and fast recipe, so it's great for busy weeknights or even an easy lunch. This weeks' #SundaySupper is all about the beloved bacon. Be sure to check out all of the amazing recipes at the bottom of this post! From breakfast to main dishes to desserts, there is something for everyone. I also want to give a shout out to Erica of The Crumby Cupcake for being our gracious host this week! Now, let's make this salad! Preheat the oven to 350 degrees. Layer the bread cubes on a baking sheet and drizzle with the olive oil. Toss to coat. Bake the cubes for 20 minutes, tossing halfway through, until toasted and lightly browned. 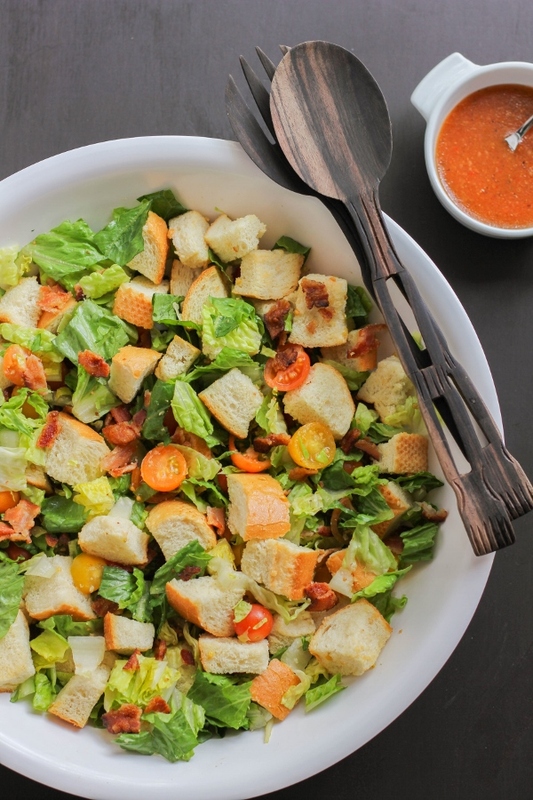 Combine the lettuce, tomatoes and bread cubes in a large serving bowl and toss to combine. Roughly chop the bacon and sprinkle it over the top of the salad. Add the dressing and toss to coat. Serve immediately.